Hey, you can’t blame me for rolling out another kale pesto recipe. I shared some of the kale pesto with a friend awhile back. Yesterday I got an email lamenting about the pasta she ate this week without the kale pesto. Might I be making another batch soon? Well, yes in fact, I think I’ll have to repeat this Ziti with Kale Pesto and Broccoli again very soon! 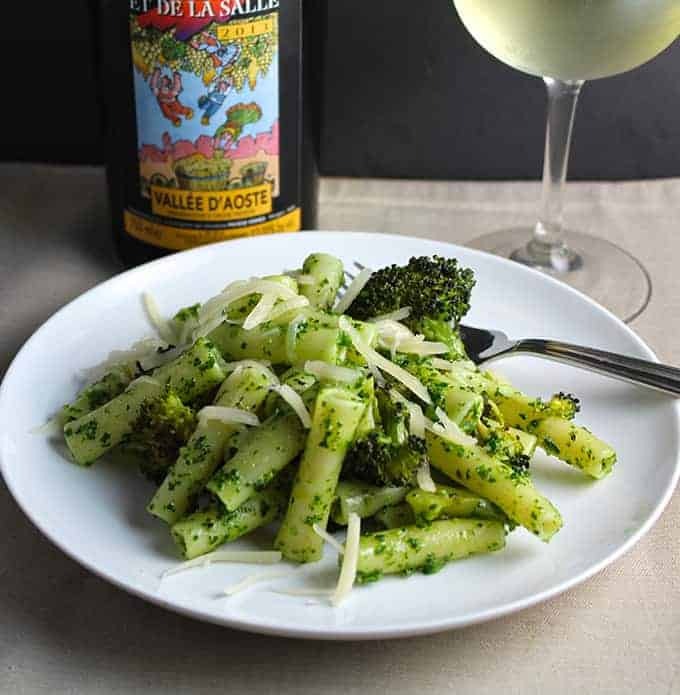 The roasted broccoli adds great depth of flavor to the zesty pesto. And it wound up pairing perfectly with our wine…which is pretty neat given the way this one came together. Jen from Vino Travels, founder of our Italian Food, Wine and Travel blogger group, reminded us that this month we’d be focusing on Valle d’Aosta. I scratched my head a bit, never having heard of this Italian region. I emailed Ray from Pairings Wine and Food, asking what wines they might have from the region. As luck would have it, Ray said they’d be opening a bottle at their Saturday wine pairing the next day. 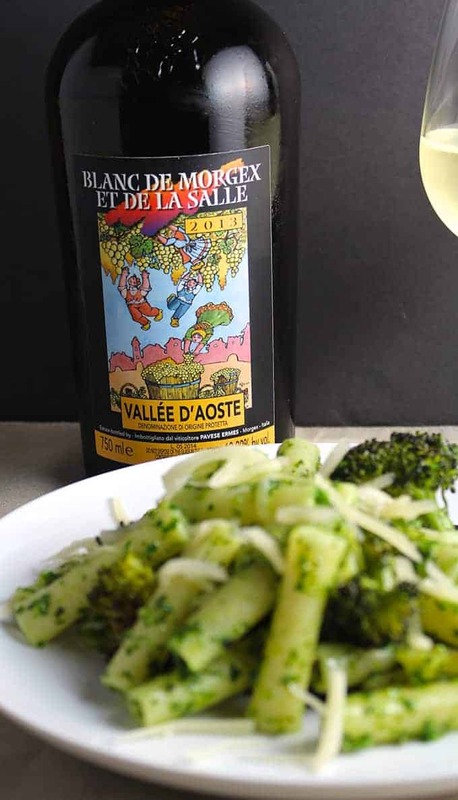 I read Ray’s description of the 2013 Blanc de Morgex et de la Salle Valle d’Aosta ($30, 12% ABV) in their newsletter, “Lovely floral bouquet with white flowers, and hints of green olive; racy and minerally with vivacity and length.” The wine is made from the Prié Blanc grape varietal native to the region. Based on this description, I thought it might pair well with pesto. Seeing as I was making this dish on Food Day 2015, I thought some healthy kale pesto would be appropriate. I would add some roasted broccoli to the dish for good measure. For more healthy and tasty recipes with kale, along with wine pairings, be sure to check out my Collards & Kale Cookbook. Boy, what a wonderful serendipitous pairing. I got a nuttiness on the nose, lemon fruit with some tartness on the first taste. Eating it along with the pesto, which has a bit of kick, I also picked up some honey and kiwi on the wine, which cleansed the palate nicely. And that nutty quality worked perfectly with the roasted broccoli. This pairing definitely gets an A.
I have to confess, I didn’t get a chance to research the Valle d’Aosta for the post, but I look forward to learning more background from my fellow bloggers (links below). I did learn at Pairings that if you stand in the vineyard where the Blanc de Morgex et de la Salle started, and throw a rock to the north, it will land in Switzerland. Throw the rock to the west, it will land in France. The winery is a good launching point for such rocks, claiming to be the highest vineyard in Europe! Time to share how you can make this easy and tasty dish. Pairings was sampling the wine with a high quality fontina cheese also from Valle d’Aosta, so I used that along with some parmesan for the cheese in the pesto. We passed that cheese at the table–nothing like food and wine from the same region! A note on the timing: you can be making the kale pesto while the ziti cooks and the broccoli roasts, so that it all comes together in about 25 minutes. Enjoy! 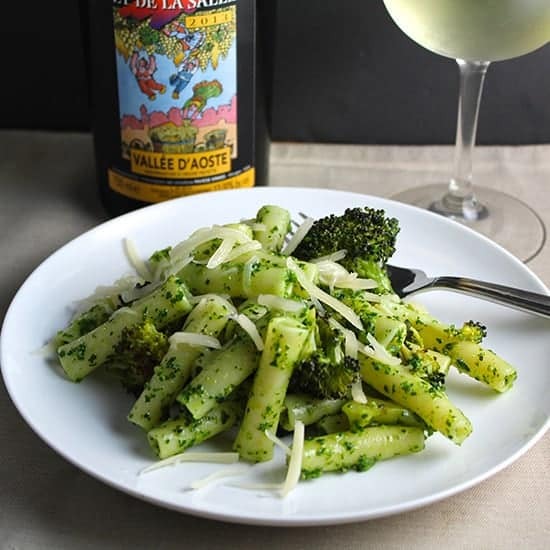 Ziti tossed with zesty kale pesto and roasted broccoli for a tasty and healthy pasta meal. Preheat oven to 425. Toss the broccoli with 2 tablespoons olive oil, garlic powder and a bit of salt to taste. Spread the broccoli out in a single layer in a medium roasting pan. Place in the oven to roast for about 20 minutes until the broccoli turns tender and begins to brown. Remove roasted broccoli from oven and set aside. Start boiling water for the ziti after the broccoli has begun roasting. Begin cooking the ziti according to package instructions. Add the pumpkin seeds, red pepper flakes, salt and pepper, cheese, and olive oil, and puree until it comes to a nice smooth consistency. Set the pesto aside while the pasta finishes cooking. Drain the ziti when it is cooked to your liking. Toss the ziti with several scoops of the kale pesto, and stir to combine. When the pasta is well coated with pesto, stir in the roasted broccoli. Plate the ziti, and pass extra kale pesto and cheese at the table for people to help themselves. Serve with an Italian white wine. Interested in more great Valle d’Aosta suggestions? Check out the other posts from members of our group. Join our discussion on Twitter at #ItalianFWT on Saturday November 7th, at 11 am EST. Thinking about an Italian wedding? Did you know the creator of this #ItalianFWT recently publish a book on planning a wedding in Tuscany? Check it out! Available through my Amazon affiliate link below. Looks like a great pairing David; light and delicious. I also love the label on the wine. How joyful! Cheers. Thanks Michelle, it is a fun label! You had me at ‘kale’! I will definitely try this recipe soon, David. Thanks for sharing. Thanks, Camilla! We like our kale around here. I’ve said this before…but I love how your recipes seems so tasting AND Healthy David. Sounds like a great pairing with a great dish! Thanks Martin, this definitely scores high on the healthy scale. Wow! 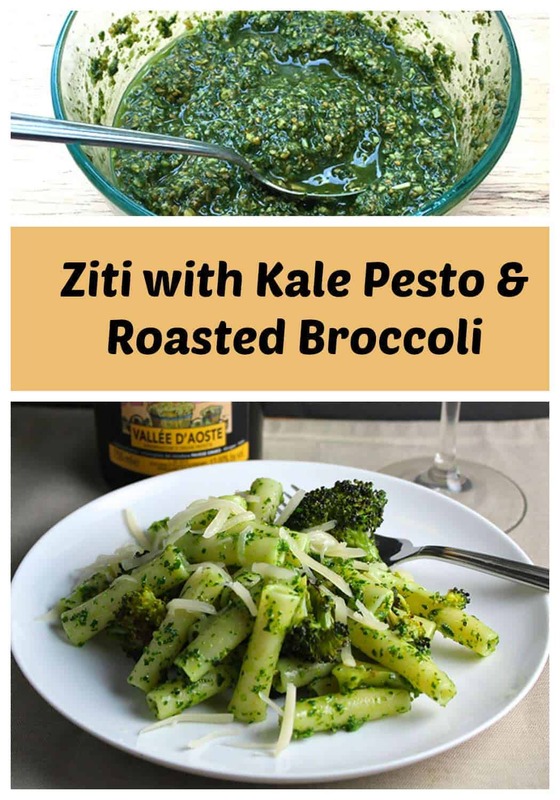 Love the sound of this pesto with the broccoli & kale. This region was such a bright spot in the month. We tried the same white – it was great with cheese!